Club History Hironori Ohtsuka was born on 1st June 1892 in Shimodate City, Ibaragi, Japan. He was the first son, and the second of four children, of Dr. Tokujuro Ohtsuka, a Doctor of Medicine. Ohtsuka Sensei was first introduced to martial arts by his great uncle, Chojiro Ebashi, a samurai warrior, who began teaching him Jujitsu. This marked the starting point of his life-long fascination with the martial arts. On the 1st April, 1897, Ohtsuka Sensei started school where he studied Shindo Yoshin Ryu Jujitsu, under the supervision of his father. Later, when he was 13, he studied the style under Shinzaburo Nakayama Sensei, the third Grand Master of this style of Jujitsu. Unlike the other schools of jujitsu at the time, Yoshin Ryu specialised in kicking and punching techniques in addition to throwing, twisting and locking techniques. Ohtsuka Sensei continued to study the style whilst at Waseda University from 1910 to 1917. He also studied different styles of Jujitsu, concentrating on their positive aspects. In doing so, Ohtsuka Sensei learned a great deal about the body's vital points for both attacking and healing purposes. In 1922, Ohtsuka Sensei attended the sports festival in Tokoyo, where he encountered Karate taught by Gichin Funakoshi, a Karate instructor from Okinawa, and a man widely held as the "Father of Modern Karate". Ohtsuka Sensei was so impressed with this that he visited Funakoshi Sensei on numerous occasions during his stay. 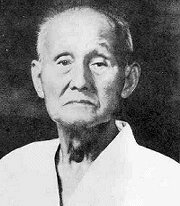 Funakoshi Sensei was, in turn, impressed by Ohtsuka's enthusiasm and determination to understand Karate and agreed to teach him all he knew about it. In the following years, Ohtsuka Sensei set up a medical practice dealing with martial arts injuries. His prowess in martial arts had led him to be the Chief Instructor of Shindo Yoshin Ryu Jujitsu at the age of just 30, and an assistant instructor at Funakoshi Sensei's dojo. By 1929, Ohtsuka Sensei was a registered member of the Japan Martial Arts Federation. At this time, Okinawan Karate only concentrated on Kata, which is a set sequence of movements against an imaginary opponent (or group of opponents). Ohtsuka Sensei thought that the full spirit of Budo, which concentrates on defence and attack, was missing, and that kata techniques did not work in realistic fighting situations. He experimented with other, more combatative styles such as Judo, Kendo and Aikido. He blended the practical and useful elements of Okinawan karate with traditional Japanese martial-arts techniques from jujitsu and kendo, which lead to the birth of Kumite, or fighting, in Karate. 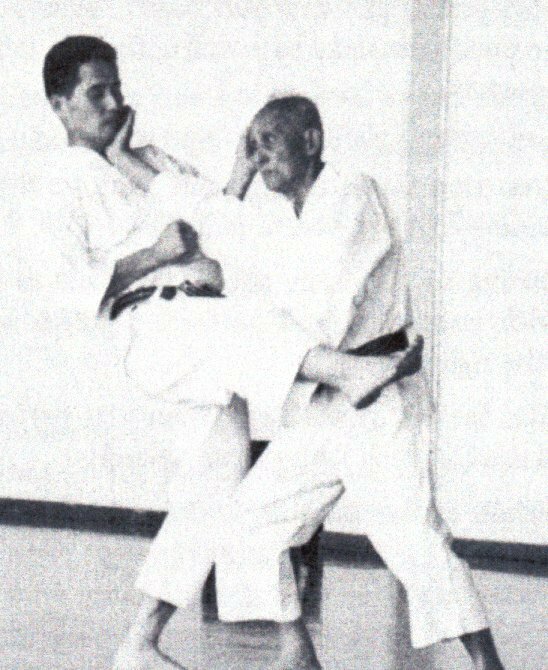 Ohtsuka Sensei thought that there was a need for this more dynamic and fluid type of Karate to be taught, so he decided to leave Funakoshi Sensei to concentrate on developing his own style of Karate - Wado. 1934 proved to be a pivotal year for both Ohtsuka Sensei and Wado Karate. On February 28th, Ohtsuka the Second was born. During this year, Wado-Ryu Karate was also officially recognised as an independent style of Karate. This recognition meant a departure for Ohtsuka Sensei from his medical practice and the fulfilment of a life's ambition - to become a full-time martial artist. Ohtsuka Sensei's personalised style of Karate was officially registered in 1938 after he was awarded the rank of "Renshi-go". He presented a magnificent demonstration of Wado Karate for the Japan Martial Arts Federation. They were so impressed with his style and commitment that they acknowledged him as a high-ranking instructor. The next year the Japan Martial Arts Federation asked all the different styles to register their names. Ohtsuka Sensei registered the name Wado-Ryu. The next few years witnessed Wado-Ryu Karate going from strength to strength. New dojos were opening and Karate was being taught at universities. Ohtsuka Sensei himself was becoming a recognised figure within the world of martial arts. Following the visit of Grandmaster Hironori Ohtsuka II to Europe in the summer of 1989, the Wado-Ryu Karate-Do Academy was founded to promote and nurture the genuine "Wado-Ryu Karate" in Europe and North America. The Wado-Ryu Karate-Do Academy (Wado Academy) is the school for following the theories and techniques of authentic "Wado-Ryu Karate" which was created by founder the late Hironori Ohtsuka I. The Wado Academy is headed by Grandmaster Hironori Ohtsuka II who inherited the vast knowledge from his father and now teaches all over the world. The Chief instructor throughout Europe is Masafumi Shiomitsu 9th Dan Hanshi. Ohku Kai is the name of the Karate Club at the Nihon University (Nichi Dai) that Shiomitsu Sensei was captain of in the 1960's. The Japanese Kanji for 'Ohku' can also be read as 'Sakura' which translates into English as 'Cherry Blossom'. This flower the national symbol for Japan (as is the rose for England). Therefore the name Okhu Kai carries the spirit of the Japanese people. Membership of the Wado Academy is automatic once you join the OHKU KAI Karate club and through this you will be issued with a Karate passport, recognised worldwide, details of which are recorded at the Japanese Wado Ryu headquarters in Tokyo by Grandmaster Hironori Ohtsuka II. Attend Wado Ryu Dan grade examination(held twice a year). Winter and summer courses, weekend courses nationally and internationally. Participate in National or international tournaments. Be eligible for consideration for instuctors certificate titles of "RENSHI", KYOSHI", "HANSHI"
The harder you sweat in peace, the less you bleed in war!